The comments on yesterday’s $11,000 2004 Subaru Forester 2.5 XT reminded me of that song. Not from the buyer’s perspective mind you. No, it was more the thought that the seller was saying to himself “I know what I’ve got and I know what that will get me.” Sadly for him, we mostly were singing another tune and dropped the car in a 59 percent Crack Pipe loss. Hey, think about these specs for a moment—66.50 horsepower; 68 lb-ft of torque; zero to sixty in 15.2 seconds. Sounds scintillating, right? 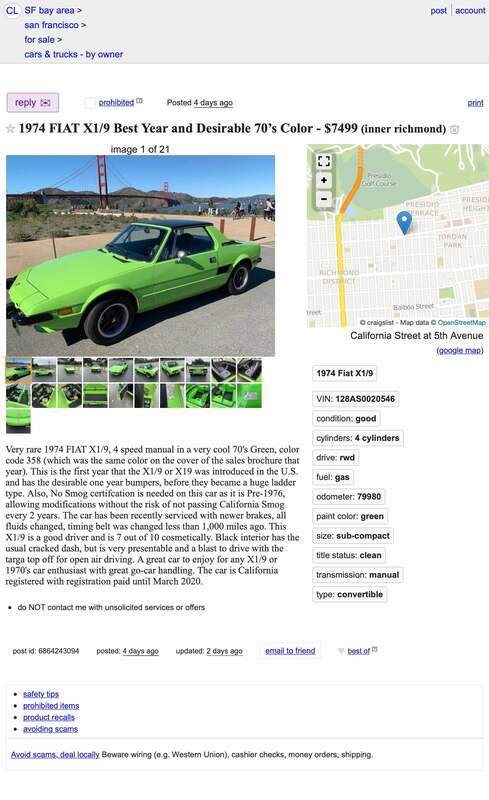 Well, now consider that those specs represent this cool 1974 Fiat X1/9. Yes, that modest power and somewhat leisurely performance is encapsulated in what is arguably the sexiest mid-engine bodywork ever offered to the car buying masses—at to least those shopping Fiats. This neon green over black edition represents from the first model year—1974—which is also the only year to feature the original black bumperettes. The ensuing year would see the X1/9 saddled with big gate-like bumpers that added to the car’s demure 1,930 pound weight and its overall length. That makes this one kind of special, perhaps even being the “best year” as claimed by its seller. The X1/9 is special regardless of year. The design is the first to take a modern FWD drivetrain and package it behind the seats. Yes, Ford did try something similar more than a decade earlier with the Mustang I concept but that was with a longitudinal drivetrain out of a Taunus. Plus, try buying one of those today! The 1290cc SOHC four here is taken from the 128 Econo-box. That was a FWD family car series that was only the second to feature a transverse engine with the gearbox on the side. The first car with that now ubiquitous layout was the Autobianchi Premula, which somewhat expectedly was also a Fiat product. In the X1/9, the engine gained a larger alloy sump and a hydraulic system for the clutch. Even with those additions, the car is a paragon of packaging. Not only does the engine and passenger compartment sit within the wheelbase but so too does the spare tire and fuel tank, residing behind the passenger and driver’s seats respectively. The targa top can be stowed in a forward storage compartment, and that’s not all, there’s another one in back to boot. This car’s specs may be modest, but its concept is grand. As is the case with many an old Fiat however, there are things to watch out for. One of those is a dashboard that tends to raisin in the sun. This one has cracks in its facia and is topped with one of those carpet toupées. The rest of the interior looks appreciably solid with seat upholstery that appears intact and window winders still resident on the door cards. There’s no radio in here however. Fiat didn’t really allot space for one, perhaps the X1/9’s only packaging flaw. That does require a dashboard box should you want something big enough to offer a tape player or CD. The bodywork looks amazingly intact and is described in the ad as “7 out of 10.” The paint is a respray as evidenced by the door seals, but is claimed to be the factory hue. Everything else appears to be in terrific shape. The engine bay displays its original aircleaner housing and the ad notes a fresh timing belt just 1,000 miles back. Wheels don’t appear to be factory, and honestly the pics in the ad are so dark that I can’t even tell what they are for sure. Total mileage is a reported 79,980 and the title is in the clear. We often parrot the sage apophthegm that its always better to drive a slow car fast than a fast car slow. Well, here’s a pretty slow car. It’s also however, a pretty interesting car and one that’s likely to continue to find an audience owing to that. Right now the seller is hoping that audience is willing to entertain a $7,499 price for the car. Just a fun fact, that’s almost twice the X1/9’s original MSRP of $3,920. Do you think the seller should get that? 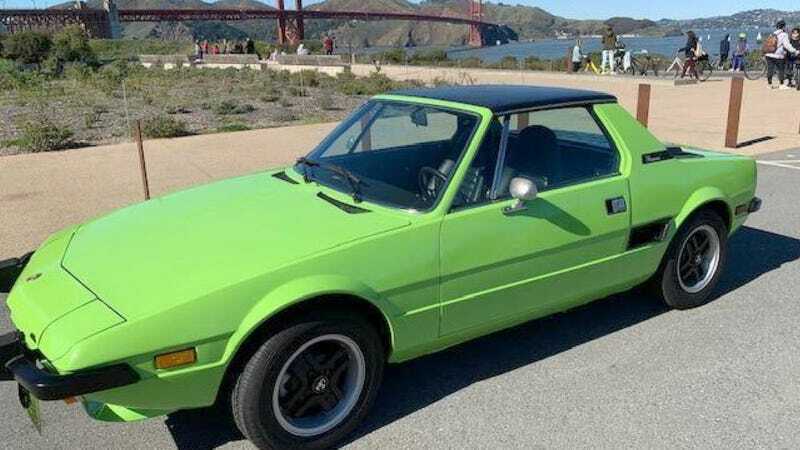 Do you think any ‘70s Fiat short of a Dino could command so much? At $7,500, Could This Modded 2013 Fiat 500 Abarth be a Small Wonder?